ConferenceXP is a platform for real-time collaboration that seamlessly connects people or groups over a network. By providing high-quality, low-latency videoconferencing and a rich set of collaboration capabilities, ConferenceXP enables working and learning toghether on-line. In this guide, you’ll learn how to use the features in ConferenceXP Client. For a summary of new features and known issues, see What's new with ConferenceXP 5. For system requirements and installation instructions, see the ConferenceXP 5 Installation Notes. When you start ConferenceXP, the ConferenceXP window appears. Here you can see available venues that you can join. After you join a venue, you can interact with other participants who have joined the same venue. For example, you can see and hear other participants, use the Presentation capability to collaborate in real time on an electronic whiteboard, or use the Chat capability to send messages. The ConferenceXP window displays venue icons. ConferenceXP displays an icon for each participant in a venue. It uses your Windows Messenger name, MSN Messenger name, or your computer’s DNS name as your profile identity. You can customize your profile. For example, you can specify your preferred name and e-mail address. The Venue window displays participant icons. By default, when you join a venue, ConferenceXP automatically opens a window for your camera’s video stream, which enables you to see what others are seeing from your camera. ConferenceXP also automatically opens a video window on your computer for each additional person who joins the same venue. The local video window displays your camera’s video image. Depending on how you’ve set up the hardware you’re using with ConferenceXP, individuals or entire classrooms can join a venue, such as when you’re using ConferenceXP for distance learning. ConferenceXP requires a high-speed (100baseT or better) such as a local area network (LAN) or Internet2. If your network also supports multicast, this will allow ConferenceXP to optimize network utilization. You can check your network connectivity using the colored indicator on the right end of the status bar on the bottom of the main ConferenceXP window. The indicator appears as a colored circle with the letters "CXP". If your network appears to be functioning the circle will be green, otherwise it will be red. If the circle is red, this is not a guarantee that ConferenceXP will not work on your network, but just a warning that there may be a problem. If multicast is not available on your network, the circle may be red, and in this case you should consider using a Reflector Service (see below). In Windows, on the Start menu, point to All Programs, point to ConferenceXP, and then click ConferenceXP Client. When you launch the client it will connect to a default Venue Service. The Venue Service provides a list of Venues or virtual meeting places. The first time you connect to a venue service, the service may prompt your for profile information such as your name and email address. If you don't see any venues other than 'Local Venue', this is an indication that your client could not reach a Venue Service. See below for information about what to do in this case. 1. On the Settings menu, click Profile. 2. Specify a friendly name: In the Name box, type the name you want to appear below your icon in a venue. 3. Specify your preferred e-mail address: In the E-mail box, type your preferred e-mail address. 4. Customize your thumbnail icon: Click the Browse button. Select the bitmap image file (for example, .gif, .tif, .png, .jpg, .bmp) you want, and then click Open. 5. Clear the thumbnail icon: Click the X button. Note: You cannot edit the identity field in this dialog. This field has a special purpose of uniquely identifying your ConferenceXP node on the network. If two nodes with the same identity attempt to join the same venue, neither one will be allowed to continue. If may be necessary to modify this field if you have two systems logged in with the same user. For information about how to do this, see Advanced Configuration below. There is a network connectivity detector built-in to ConferenceXP. The indicator for this utility is a red or green icon on the lower right of the ConferenceXP client window, on the right end of the status bar. Green light means the multicast connectivity test signal is received, and your multicast connectivity should be good. If a Reflector service is configured and enabled, the green light means that the reflector is reachable on the network. Red light means the test signal is not received, and you may have difficulty using ConferenceXP with nodes outside of your local network. If a Reflector service is enabled, the red light means that the reflector is not reachable on the network, and it may be necessary to choose a different one. Note: Depending on the participants of your conference, the indication of the red or green light may be incorrect! If the light is green, you still won't be absolutly sure the multicast is working until you have tested with a particular set of participants. Likewise if the light is red, don't be sure it won't work. Tip: If you cannot use multicast for your conference, you may want to configure your client to use a Reflector Service. You can also use ConferenceXP in a two-way conference if you don't have multicast. See below for more information. In the ConferenceXP window, click the icon of the venue you want to join. Some Venues have a lock icon which indicates they are protected by a password. After you click on an icon of this type, you will be prompted for a password before you can join. Note To join an IPv6 venue, you must have the IPv6 protocol installed. In the Venue window, click Leave Venue. If you don't have working multicast, or if you don't have a venue, AND if you only want to conference with one other node, a two-way unicast conference may be just what you need. 1. On the Actions menu, click Start a Two-Way Unicast Conference. 2. Give the other participant the IP address of your computer, and get the IP address of the other participant’s computer. Enter the remote address, and click OK. Note: If your computer has more than one network card, it may have more than one IP address. The IP address that appears in the Give the remote participant the IP address of your computer box is the recommended IP address for two-way conferencing. 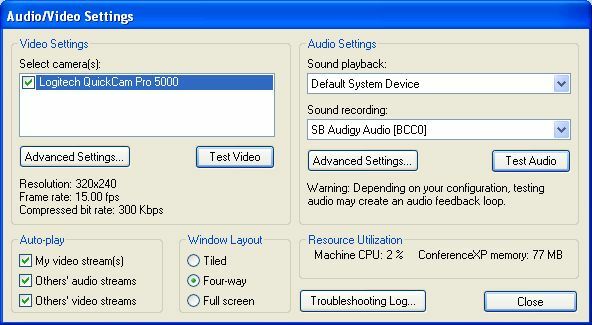 ConferenceXP enables you to specify many audio and video settings. You can choose which audio device you want to use for playing back sound and for recording sound. You can also specify the input source for your microphone. If you have more than one video camera connected to your computer, you can choose which camera or cameras you want to use with ConferenceXP. If you are using more than one camera, you can specify which camera you want to associate with your microphone. Associating a camera and a microphone means that they share one window in the UI when you join a venue. You can test your audio and video using buttons provided in the audio/video dialogs. ConferenceXP queries your video device for the manufacturer's advanced settings, which it displays in the Advanced Video Settings dialog box. Finally, you can configure default window layout and auto-play settings. To begin, while not in a venue, use the ConferenceXP Settings menu, and click Audio/Video. Under Video Settings, in the Select camera(s) list, select the check box to the left of each camera you want to use. To test a video camera, select it then click the Test Video button. Select a camera and click the Advanced Video Settings button to access the configuration details. Click the Camera button to access the camera manufacturer's advanced settings. Click the Video Format button to access the format details such as frame size, frame rate and pixel format. It is possible to specify a higher bit rate than what the compressor can produce. The network bandwidth is going to be higher than the compressed bit rate because of the per packet and per frame overhead introduced by ConferenceXP. In addition, forward error correction adds up to one extra packet per frame of data. If you do not use video compression, you should probably also disable forward error correction because it will not work well with high data rates. On the right-hand side of the Audio/Video Settings Dialog you will find audio settings. Here you can choose the audio playback and recording device. You may use the Test Audio button to test the local audio recording and playback. Warning: If you have open mics and speakers connected, the Test Audio button will create an audio loop and may create feedback. In this case be sure the volume is turned all the way down before clicking the Test Audio button. To access more audio configuration options, click the Advanced Audio Settings button. Choose a format for uncompressed audio. If uncompressed audio is used, disabling forward error correction is highly recommended. 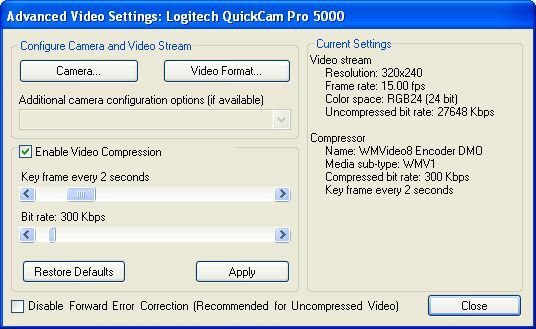 It is possible to mix compressed video with uncompressed audio (bandwidth permitting). Larger audio buffer sizes are recommended for higher bandwidth audio and especially for high bandwidth uncompressed audio. Generally speaking, larger buffers result in more latency, but buffers that are too small may lead to choppy or stuttering audio. Use the Test Audio button to tune the buffering for your preferred format. 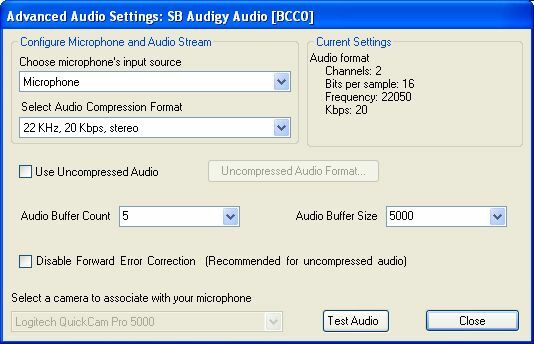 The buffer size parameter can also be used to synchronize the audio/video streams. The higher the buffer size, the higher the audio latency in relation to the video stream. Experiment with different buffer sizes until the audio and video streams are satisfactorily synchronized. Some audio cards may suffer from stuttering problems when running uncompressed audio in test mode even though the receiving computer might be able to receive it correctly. If audio stuttering is experienced in test mode - regardless of buffer size - using a second computer as a receiving client to verify that the stream is working correctly is recommended. Buffer numbers of between 4 and 6 have been shown to work well in most cases. When using only one microphone (as in the case of a webcam), choosing mono instead of stereo will help to reduce bandwidth, specially with uncompressed audio. Tiled: Video windows open at their native sizes, and are positioned next to each other, left to right, top to bottom. Four-way: Video windows open at a quarter size of the screen and are positioned next to each other, left to right, top to bottom. Full screen: Video windows open at full-screen size and are positioned one in front of the other. Note: If you have enabled the ConferenceXP window location persistence feature, and you have previously moved or resized a window for a particular participant, the persisted size and location will override the default settings you configure here. To enable or disable window location persistence, select "Persist Window Positions" from the ConferenceXP Actions menu. Tip: To maximize an open video or capability window, double-click the window’s title bar. In the Audio/Video Settings dialog you can also configure the audio and video auto play settings. These settings will control what happens automatically when you join a venue. My video stream: Enable to send your video streams automatically when you join a venue. Others' audio streams: Enable to automatically play back other participants’ audio streams when they or you join a venue. Others' video streams: Enable to automatically play other participants' video streams when they or you join a venue. Note: If you choose to stop playing your video streams, ConferenceXP still opens a video window with a black background for your video stream. After you join a venue, you can choose to play or stop playing an audio or video stream at any time. For instructions, see Play or stop playing an audio or video stream. If you do not want to send your audio stream automatically, under Audio Settings, in the Sound recording list, click <none>. If you are having trouble using a audio or video device with ConferenceXP, you may be able to get more information about the problem by using the Troubleshoot Log button in the Audio/Video Settings dialog. The log will show all the media types that are supported by your devices, and any exceptions that occurred within DirectShow when the devices were used. There are known issues with audio on Vista that can cause audio to be very choppy. This occurs because the codec used by ConferenceXP is not available by default on Vista. To manually install the codec, see the ConferenceXP installation notes. Before you join a venue, you can specify the default device and auto-play settings you want using the Audio/Video Settings as described above. After you join a venue, you can specify which streams you want to send and play individually. Note: If you choose to stop sending your video stream, neither you nor anyone else can view your video stream. If you choose to stop playing your video stream, you can no longer view your video stream, but others can, since ConferenceXP is still sending the stream. You can temporarily stop playing a video stream by clicking the Pause button on the control bar of the video window. To resume playing the video, click the Play button. You can also temporarily stop sending your video stream by clicking the Camera icon or stop sending your audio stream by clicking the Audio icon. A red circle with an “x” appears on the icon when no stream is being sent. To resume sending your video or audio stream, click the Camera icon or Audio icon again. When you click the Close button in the video window, ConferenceXP stops playing your video stream on your computer and stops sending your video steam to others in the venue. To send or play your video stream again, you must leave and then rejoin the venue. In the Venue window, right-click the participant icon you want, and then click the stream you want to stop or play. Tip: You can also choose to stop sending your audio or video stream in your video window. In the control bar of your video window, click the Camera icon . Click the Camera icon again to resume sending your video. Note: Clicking the Close button in the video window causes ConferenceXP to stop playing your video on your computer and to stop sending your video to others in the venue. To send or play your video again, you must leave and then rejoin the venue. In the control bar of your video window, click the Microphone icon. Click the Microphone icon again to resume sending your audio. In the control bar of the video window, click the Pause button. Click the Play button to resume playing the video. Capabilities, like add-ins, enable developers to customize the functionality of ConferenceXP. Capabilities included with ConferenceXP appear on the Actions menu. When you install a new or custom capability, it appears on the Actions > Start Other Capabilities menu. Presentation: Collaborate on an electronic whiteboard or PowerPoint presentation with other participants in the venue. Chat: Send instant messages to all other participants in the venue. Windows Media Playback: Play a Windows Media file in a video window and send it to all participants in the venue. Local Screen Streaming: Send continuously updated images of your desktop in a video window to all participants in the venue. Shared Browser: Share your browser window with other participants in the venue. UW Classroom Presenter 3: Project your PowerPoint presentation in a conference or classroom setting and use its advanced inking features. ConferenceXP capabilities send and receive presentations by using the RTDocuments protocol. Capabilities can send presentations, view presentations, or both. Presentation viewers, such as ConferenceXP Presentation and Microsoft OneNote, appear on the Presentation Viewer submenu. If you have more than one presentation viewer installed, you can choose the one you want to use. Owned capability: A participant owns these capabilities. The participant who starts the capability owns it. When that participant leaves the venue, the capability they started closes. ConferenceXP Presentation is an owned capability. Venue capability: The venue owns these capabilities. When the participant who starts the capability leaves the venue, the capability remains open for as long as there is at least one participant in the venue or a participant chooses to close the capability. ConferenceXP Chat is a venue capability. 2. On the Actions menu, click Start Presentation. ConferenceXP Presentation opens in a new window. 2. On the Actions menu, click Start Chat. 3. Type the topic you want to discuss, if you want, and then click OK.
4. In the lower Chat pane, type your message, and then click Send. Tip: To maximize the chat window, double-click the window’s title bar. 2. On the Actions menu, click Start Windows Media Playback. 3. In the Windows Media File dialog box, click Select File. 4. Select the Windows Media file you want to play, and then click OK. Continuously play the file: Select the Repeat check box. Play the file: Click the Play button. Pause the playback: Click the Pause button. Stop playing the file: Click the Stop button. Tip: To maximize the window displaying the Windows Media file, double-click the window’s title bar. 2. On the Actions menu, click Start Local Screen Streaming. Tip: To maximize the window displaying the streaming desktop image, double-click the window’s title bar. 2. On the Actions menu, click Start Shared Browser. A new Microsoft Internet Explorer browser window opens. 3. In the new Internet Explorer window, go the Web page you want. 2. On the Actions menu, click UW Classroom Presenter. 3. Open a PowerPoint presentation if desired. 2. On the Actions menu, point to Start Other Capabilities, and then click the capability you want. View open venue capabilities: On the Actions menu, point to Active Venue Capabilities. Start a venue capability on your computer: On the Actions menu, point to Active Venue Capabilities, and then click to add the check mark next to the capability channel you want to start. Close a venue capability on your computer: On the Actions menu, point to Active Venue Capabilities, and then click to remove the check mark next to the capability channel you want to close. 1. On the Settings menu, point to Presentation Viewer, and then click the one you want. 2. In the confirmation message that appears, click OK.
With Archive Service, you can record a ConferenceXP session and you can play back previously recorded ConferenceXP sessions. To enable Archive Service in ConferenceXP, specify the archive service you want to use. If Archive Service is installed on a network computer, you can get your Archive Service computer’s host name from your system administrator. For the Archive Service host name, you can specify either the IP address or the DNS name of the host computer. If you want to specify a port, follow the host name with the port number you want to use, separated with a colon. For example, host:xxxx, where host is name of the host computer and xxxx is the port number. If you specify no port, ConferenceXP uses the default Archive Service port, which is 8082. If you choose to play a recorded conference while not in a venue, only you can see the playback. If you join a venue and then choose to play a recorded conference, you as well as everyone else in the venue can see the playback. You can choose which streams in the recorded conference you want to play back. When you record a ConferenceXP session, ConferenceXP records and archives all streams being sent, which may be continuous data streams, such as audio, video, Windows Media Playback, and Local Screen Streaming, or non-continuous data streams, such as Presentation and Chat. Note: The playback of archives containing encrypted streams is not supported. 1. While not in a venue, using the Settings menu, click Services. 2. Click Configure Archive Services. Specify a host computer by name and use the default port: Type the DNS name of the host such as: my.archiveservice.com. This is all that is needed for most cases. Specify a host computer by name and specify a port number: Type the host name followed by a colon and then the port number you want to use, such as: my.archiveservice.com:8080. This would only be needed if the port used by the Archive Server is not the standard port. 6. Use the check box to Enable Archive Service. 7. Select the preferred Archive Service in the drop-down menu. The port number you specify must be the same port number used by the Archive Service. Check with your network administration to make sure you are specifying the same port number. Archive Service does not support IPv6 addresses. Tips: You can shorten IPv6 addresses by substituting consecutive zeros with double colons. For example, you can shorten 2000:0:0:0:0:79ff:0:f77 to 2000::79ff:0:f77. 1. On the Settings menu, click Services. 3. In the My Archive Services list, click the Archive Service you want to replace. 4. In the Archive Service host name and port box, make the changes you want, and then click Replace. 5. In the confirmation message, click OK. Tip: For the host name, you can specify either the IP address or the DNS name of the host computer. If you specify no port, ConferenceXP will use the Archive Service default port. If you want to specify a specific port, follow the host name with the port number you want to use, separated with a colon. For example, localhost:xxxx, where localhost is name of the host computer and xxxx is the port number. 3. In the My Archive Services list, click the Archive Service you want to delete, and then click Delete. 4. In the confirmation message, click OK.
2. Select or clear the Enable Archive Service check box. Note: If the Enable Archive Service check box is dimmed, you’ll need to add an Archive Service. If the Archive Service you want does not appear in the list, you can add the one you want. For instructions, see add an Archive Service above. 2. In the Archive Service list, click the Archive Service you want. Tip: If the Archive Service you want does not appear in the list, you can add the one you want. For instructions, see add an Archive Service above. 2. On the Actions menu, click Record This Conference. 3. In the Name box, type a name. 4. When you’re ready to record, click the Record button. The Archive Service (RECORDING) participant appears in the venue, and the time marker starts counting, indicating the Archive Service is recording your session. 5. When you’re done recording, click the Stop button. When recording a conference with multiple participants using ConferenceXP Presentation, make sure the initiator of Presentation closes Presentation before stopping the recording. To ensure proper playback after the initial recording, make sure all participants leave the venue before anyone chooses to play back the recording. 1. If you want to play back a recording and enable others in the same venue to view it, join a venue. To play back only for yourself, you can skip this step. 2. On the Actions menu, click Play a Previously Recorded Conference. 3. Under Conferences, click the recorded Conference you want. 4. Under Streams, select the check box next to the streams in the recorded conference you want to play back. 6. In the Conference Playback dialog box, click the Play button to start playing the conference. The Archive Service (Playing) participant appears in the venue, indicating Archive Service is playing back a recorded session. You can move the slider to the point that you want to play. However, if you move the slider while playing a non-continuous data stream, such as Presentation and Chat, playback may not start at the new point as expected. When playing back a Chat stream, the name for each message is "Archive Service (Playing)", no matter which participant typed the message. If you’re using ConferenceXP Client in a unicast-only network, or if there is a multicast failure somewhere between your network and the network of the other conference participants, you can use the Reflector Service to send and receive multicast transmissions over unicast. For example, if multicast is not supported by a router in your network, preventing your ConferenceXP client from connecting to other clients in a multicast-enabled network, you can use the Reflector Service that is on a multicast-enabled network to see the other participants in a multicast network. To join a multicast venue, you must first specify a Reflector Service and then enable the Reflector service. You can also use a reflector service to make a pure unicast conference, where all participants are configured to use the same reflector service. To use the Reflector Service, you can use a ConferenceXP hosted Reflector Service, or you can install a ConferenceXP Reflector Service on a server in your multicast-enabled network to receive the multicast network traffic and forward it to your ConferenceXP client over unicast. Note that you cannot run the ConferenceXP client and the Reflector Service on the same system. 2. Click Configure Reflector Services. Specify a host computer by name and use the default port: Type the DNS name of the host such as: my.reflectorservice.com. This is all that is needed in most cases. 6. Use the check box to enable the Reflector Service. 7. Make sure your preferred reflector service is selected using the drop-down menu. Note: The port number you specify must be the same port number used by the Reflector Service. Check with your network administration to make sure you are specifying the same port number. 3. In the My Reflector Services list, click the Reflector Service you want to replace. 4. In the Reflector Service host name and port box, make the changes you want, and then click Replace. Note: The first time you add a favorite Reflector Service, the Enable Reflector Service check box is selected automatically. Tip: For the host name, you can specify either the IP address or the DNS name of the host computer. If you specify no port, ConferenceXP will use the Reflector Service default port. If you want to specify a specific port, follow the host name with the port number you want to use, separated with a colon. For example, localhost:xxxx, where localhost is name of the host computer and xxxx is the port number. 3. In the My Reflector Services list, click the Reflector Service you want to delete, and then click Delete. 2. Select or clear the Enable Reflector Service check box. Note: If the Enable Reflector Service check box is dimmed, you’ll need to add a favorite Reflector Service. If the Reflector Service you want does not appear in the list, you can add the one you want. For instructions, see add a Reflector Service above. 1. On the Settings menu, click Services. 2. Under Reflector Service, in the list of Reflector Services, click the Reflector Service you want. Tip: If the Reflector Service you want does not appear in the list, you can add the one you want. For instructions, see add a Reflector Service above. In ConferenceXP, the Venue Service you’re connected to determines which venues you can see in the ConferenceXP window. ConferenceXP displays the Venue Service you’re currently connected to in the status bar of the ConferenceXP window. You can specify your favorite Venue Services and connect to a different Venue Service from within ConferenceXP. In the ConferenceXP window, the URL of the Venue Service you’re currently connect to appears in the status bar. 2. Click Configure Venue Services. 3. In the Venue Service URL box, type the URL of the Venue Service you want to add, and then click Add. 5. Select the preferred venue service using the drop-down menu. Note: The Venue Service URL must start with http:// or https://. 3. In the My Venue Services list, click the Venue Service you want to replace. 4. In the Venue Service URL box, make the changes you want, and then click Replace. 7. Select the preferred venue service using the drop-down menu. 3. In the My Venue Services list, click the Venue Service you want to delete, and then click Delete. 2. Under Venue Service, in the list of Venue Services, click the Venue Service you want. Tip: If the Venue Service you want does not appear in the list, you can add the one you want. For instructions, see add a Venue Service above. The problem was traced to a Windows service called "Windows Media Player Network Sharing Service". The workaround was to stop the service while running ConferenceXP using Control Panel:Administrative Tools:Services. In general, any process that binds exclusively to UDP ports 5004 or 5005 could cause this issue. A general solution is to use 'netstat -ano' to determine the process ID that is bound to the port, then taskmgr to discover the name of the process or service so that it can be stopped. High CPU utilization will cause problems with local and remote audio and video, including audio break-ups and video freezing. Use the Windows Task manager to view CPU level. Any level at or near 100% is likely to be problematic. To resolve such problems, first check if any non-critical application or service other than CXP is using excessive CPU. If you can terminate that application or service, it may solve the problem. Of particular note, the Windows Indexing service associated with Windows Desktop Search has been has been seen causing such problems on Windows XP. Other steps to resolve or work around high CPU issues include: Not rendering all video streams; Using smaller, lower-bandwidth video; Using higher powered systems. Constrained network throughput will cause audio and video to break up. Remote video is likely to "Ghost" and freeze, while audio will break and stutter. You will generally be able to tell the difference between CPU and network issues by checking the Windows Task Manager to verify that the CPU level is not excessively high. To diagnose this issue, try connecting two systems on known good wired ethernet, ideally connected to the same physical switch, and verify proper behavior. Anti-virus packages can interfere with ConferenceXP in some cases. In particular we have noticed that Sophos Antivirus must be uninstalled to allow ConferenceXP to work in some high-bandwidth scenarios (disabling the scan is NOT sufficient). We have also observed MacAffee Antivirus causing issues in certain configurations. The general issue is that outbound bandwidth becomes constrained by the scanner, causing a poor quality experience on the receiving system. When more than one USB HD webcam is used to send from a single system, there may be an issue that causes one or more of the images to be displayed as a black window. This appears to be a problem related to USB bandwidth. It may be possible to get better results by using a system with multiple USB root hubs, and spreading cameras around on different hubs. It may also be possible to work around the problem by using different camera resolution and/or frame rate settings. In some cases different camera drivers may have differing bandwidth requirements. Windows 7 includes a USB bandwidth measurement tool that may be helpful. This is found through the device manager: Right-click a USB controller, select Properties, then the Advanced tab. The local video will show as a black window if the selected video compressor is not available. This can happen if the installed Windows Media Player version is v.9 or earlier. To resolve, upgrade Windows Media Player to version 10 or later. Some versions of Windows Media broke the CXP DV video compression. Specifically this impacts systems with Windows Vista or Windows XP using Windows Media Player version 11. The video compression works on Windows 7 and on Windows XP with Windows Media Player version 10. If you are using Windows XP with WMP version 11, you may want to downgrade your WMP version. To do so use Add/Remove programs to uninstall both Windows Media Player 11 and Windows Media 11 Format Runtime. This will initiate roll-back processes. After rolling back, reboot, then the WMP version should be 10, and DV compression should work. There is no known way to downgrade the WMP version on Windows Vista. Note that you can still use uncompressed DV video with WMP 11 on XP and Vista. In the Audio/Video Settings dialog box, note the name of the DV device listed in the cameras box under Video Settings. Note the exact name, including capitalization and spaces. Open the CXP Client config file found in the ConferenceXP application directory using notepad or a text editor of your choice. The name of the config file is 'cxpclient.exe.config'. Save the file and restart ConferenceXP. You may of course still use uncompessed audio with either 32 kHz or 48 kHz. Note: this issue was resolved in ConferenceXP 5.1 by adding the codec to the client setup. The audio codec used by ConferenceXP "Windows Media Audio V2" is not included in Vista. If the codec is not installed, the only audio options available will be uncompressed. One symptom if the missing codec is very choppy audio. Another symptom is that setting the audio compression check box in the advanced audio dialog doesn't stick on. The audio codec package used to be available here, but it now appears to have been removed: http://support.microsoft.com/kb/324290. Even presuming you could get the download, the installation was found not to work using the included setup executable. The following manual procedure was used. Now the codec should be installed. When the client is in a conference with other nodes which are using the local reflector service, the local client should be configured for multicast (uncheck the reflector enabled check box in the services dialog of the client). This configuration should allow all streams to be sent and received correctly. After an archive is created, it can be played back on the local system only after joining a venue. Remote systems will still be able to play back when outside a venue. Temporarily stopping the Reflector Service, then restarting the client will allow this to work. Two-way unicast conferences will not work on the system. Temporarily stopping the Reflector Service will allow this to work. When the client sending uncompressed DV audio joins a venue with 5.0 or earlier clients, the older clients will see an assertion failure. It is safe to click ignore, and the client should work after that point. To work around, upgrade all clients to 5.1 or later. We have received a report that a May 2010 update to Adobe Photoshop or Distiller may interfere with the ConferenceXP audio codec. The workaround noted was to uninstall and re-install the ConferenceXP Client after the update. The analog audio input was found to work with ConferenceXP only when the analog video input was also active. The Test Audio function in the Audio/Video Settings dialog was found not to work, even though audio was indeed present when the user joined a venue. The only uncompressed audio format available from the device was 48Khz, a format which the default audio compressor in ConferenceXP cannot support. Therefore, only uncompressed audio worked with this device. This can be used to script ConferenceXP startup or to work around a missing or broken venue service. There are a set of advanced settings available in the ConferenceXP client configuration file found in the application directory with the name CXPClient.exe.config. This is a XML file which can be edited using a programs such as notepad. There are a number of settings available in the file, some of which are self documenting, and others have comments which describe their use.